Combining colours and when opposites attract…. 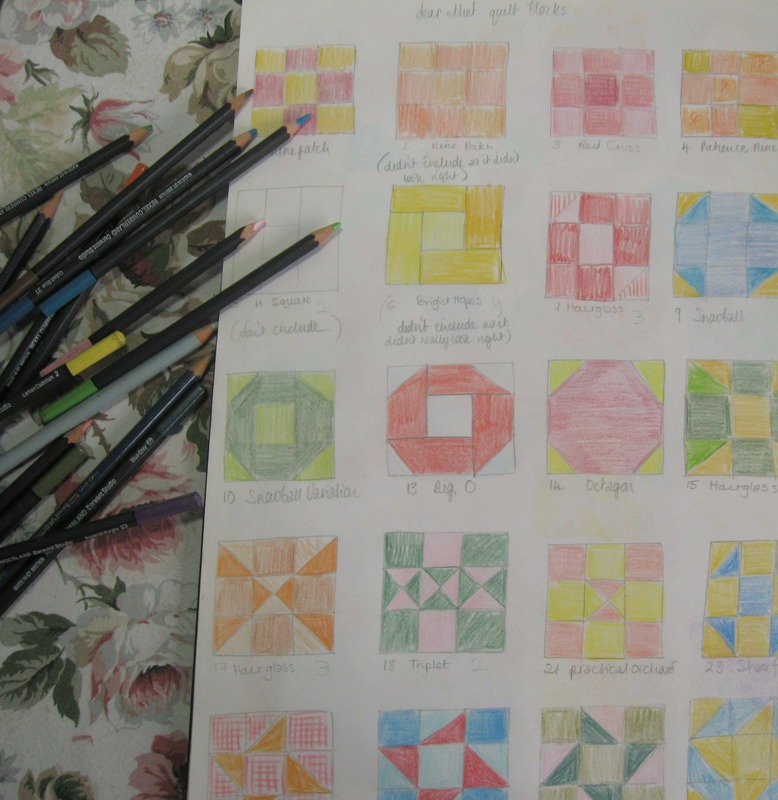 Some time ago now, I wrote a post about how I go about choosing colours when I’m making quilts, crochets and embroideries…I always find it easier to go back to basics, and to think about the primary and secondary colours before giving any thought to how and why some combinations work and how others are a bit hmmppphh rather than “wow”. Often before I start a project I make a colour wheel from all the pieces of fabric using bits from the nearest scrap bag to hand…..with a couple of extra colours to the red,orange,yellow, green,blue,violet/purple…and that’s teal (bluey green) and pink…you wouldn’t normally get either one on a colour wheel as they’re tints (pink being made by adding white to red, teal being created by adding white to bluey green) but pink is a tint/colour I find that I use a lot and personally think it combines well with most other colours. I also like teal a lot as well. Thinking about it I like pink with just about every colour, about the only pink pairing I don’t like is with purple…..though orange can be a bit hmmm but it depends on the colour pink I use….. I found by having a bit of a play emptying out a scrap bag or getting out a big selection of fat quarters* and making a colour wheel on the carpet, helps you to understand why certain combinations can look so good…it also helps you think about putting other colours together that you might not first think about. Another example of using shades of the same colour is this little block….4 different fabrics are used, 3 which are blue based (one dark and two mid tones) then the other fabric which although has blue and pink in it is a “white” colourway of the print…..all the fabrics used are prints rather than solid colours as I prefer to work with those and often pick up tiny dabs of colours from one print and then work to match that with a contrasting fabric. Analogous colours are when you pick colours that sit next next to each other on a colour wheel (such as red and orange, blue and green, blue and purple)…. There’s no jarring when you use them together, and they’re generally pleasing to the eye. I tend to pick one stronger colour to be the main focus and then another to compliment it….the yellow print above is quite an intense colour, there are flecks of it in the floral print but the orange tulips are what the eye wants to focus on first. You often find analogous colours together in nature which may be why they seem more restful to the eyes than colours that bounce off each other…. (yellow and green daffodils or primroses…blue and green bluebell woods or forget me nots…. )…when a blue and green look this stuning in real life then you know that when you pick these colours for embroidering or knitting or patchwork (or even a wardrobe choice) then that will look equally beautiful. I’ve mentioned the Stranded Colourwork Sourcebook several times before on my blog and it’s such an excelllent reference book for understanding colour choices, looking at depth of colour, lights and dark, creating movement that is needed for knitting (but which I find essential for patchwork too)…..and while I’ve yet to create any stranded knitting yet of my own (also known as Fairisle knitting) I’ve found it an incredibly helpful book to read regarding how I pick and chose colours for my patchworks….as an inspirational starting point it’s so good….it’s not a random book of pretty pictures (though many are really beautiful) Felix can see the beauty in patches of tarmac on the road or in Victorian brickwork, everyday things that often are overlooked……it’s the enthusiasm and encouragment that are found within the pages along with the colour theory and thoughtfulness about colour choices that help make this such a great book. Other times the contrast is there both in tone and pattern…a mix of delicate floral print combined with bold brighter hues…..
I’ve not yet tried this with my knitting but I’ve enjoyed experimenting and playing with colour with my crochet…..I like using combining subtle shifts in colour and tone…..
…with swift changes that flitter back and forth…..
A little exercise I find quite useful to do is to paint up a series of the same block (something simple like a churn dash or star), trying out one colour (or tint) with all the others……pink with red, green, blue, grey, orange and so on….different blues with purple,green,yellow,grey…..some you’ll love, some you’ll hate but I’m sure you’ll see some that you hadn’t thought would look all that but which are a very pleasant surprise…. *you could of course use wool, embroidery threads, tapestry wool but you might want to put a clean sheet down first as those tend to pick up carpet fluff a lot more than fabric. Deja vu or haven’t I seen these blocks before…. A couple of weeks ago I had a bit of a tidy up in my work room (and looking around at the wobbly piles dotted round me which include crochet cushion covers, patchwork quilt tops, a half finished ironing board cover, tins of darning wool, and general sewing clutter, I can see I need to tidy up again)…..and mid tidy I thought to go through the little blocks I’ve been making for my “dear ethel” quilt. Most of the blocks made me so happy to look at but there were a few that I wasn’t so pleased with, they were just a bit lacking. 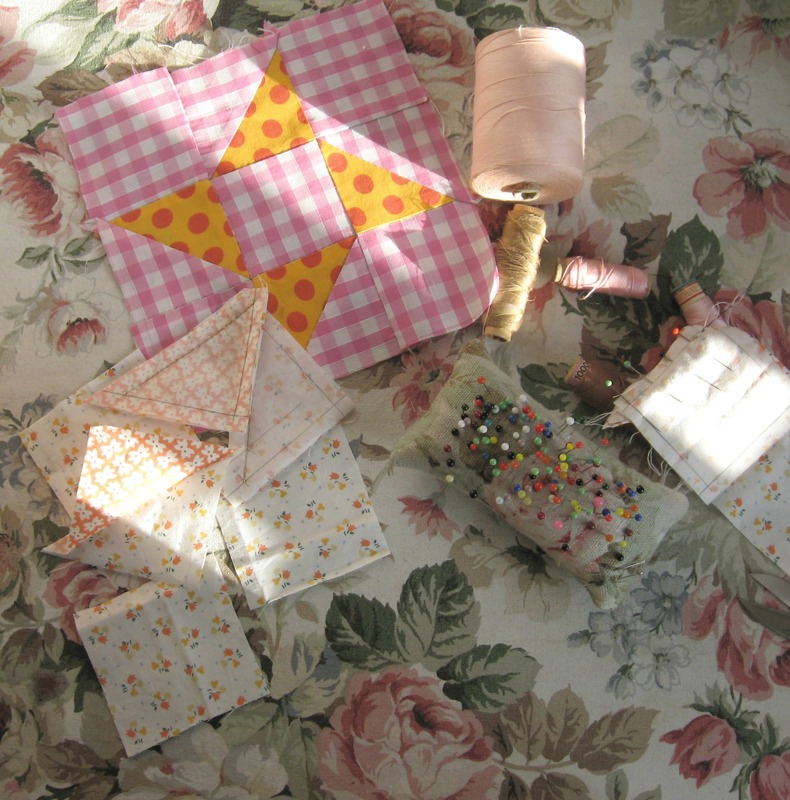 I probably could have used them in the quilt and they would have been fine, but I also know what I’m like so I decided to just re-sew the blocks I wasn’t so keen on. 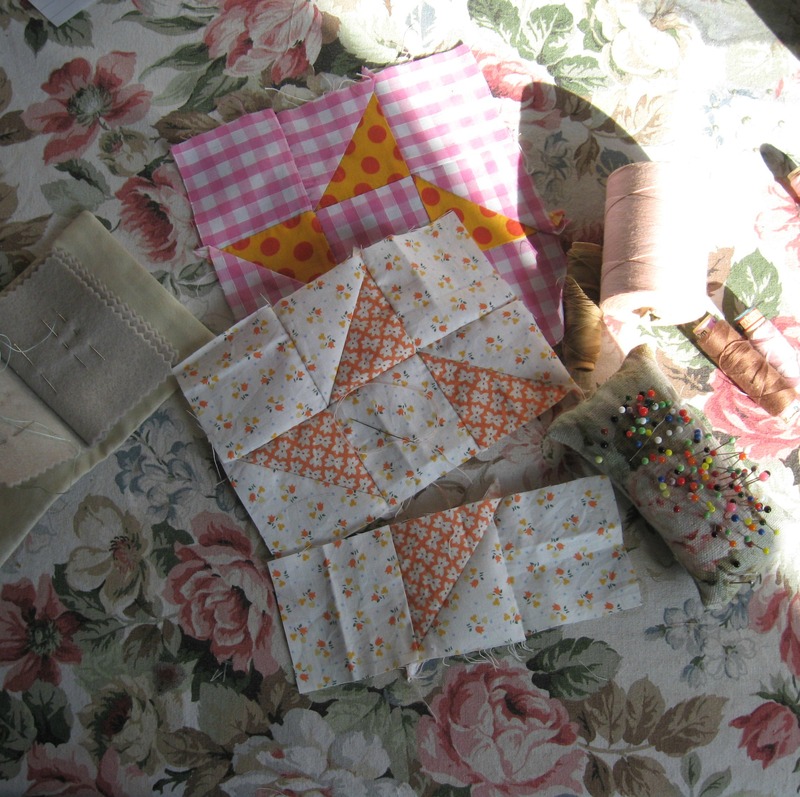 The old blocks have been put to one side to make into pot holders (although one was completely un-picked so I could use the fabric in two new blocks)….I had some odd shaped pieces left from making the star quilts so I was able to use up a lot of fabric destined for the scrap bag (I call it a bag but it’s more like a hoard). 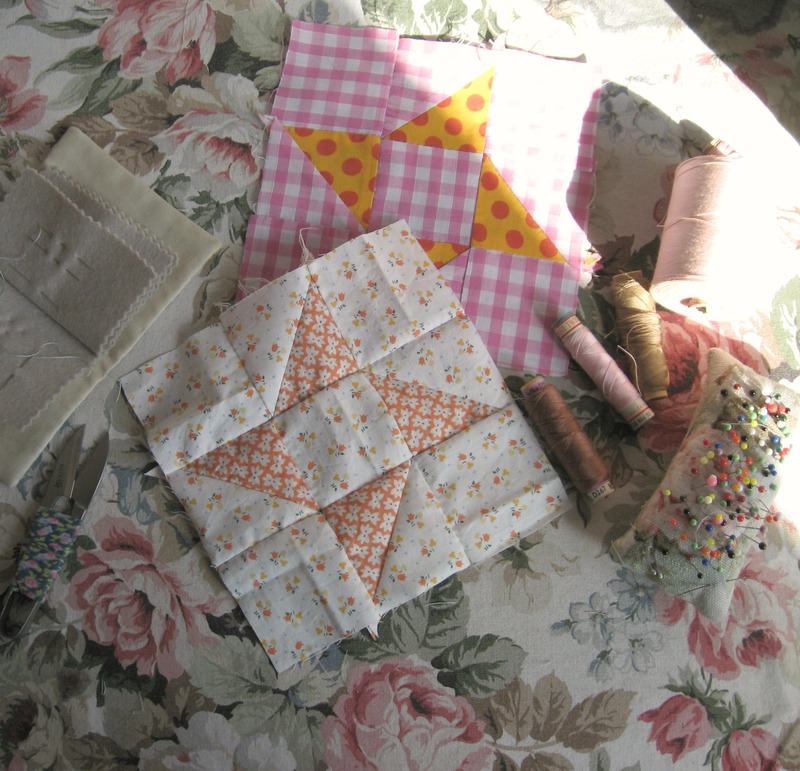 Actually it was while sewing the patchwork for the star quilts that I began to think again about the “dear ethel” blocks. 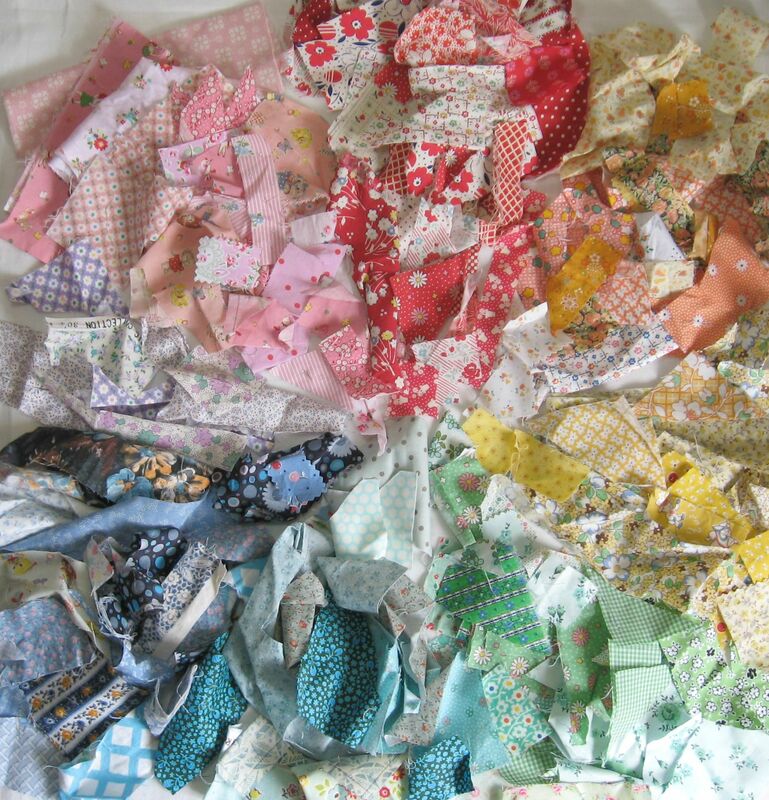 some of the fabric picked for those quilts is just so pretty that I wanted a few keepsakes of my own. 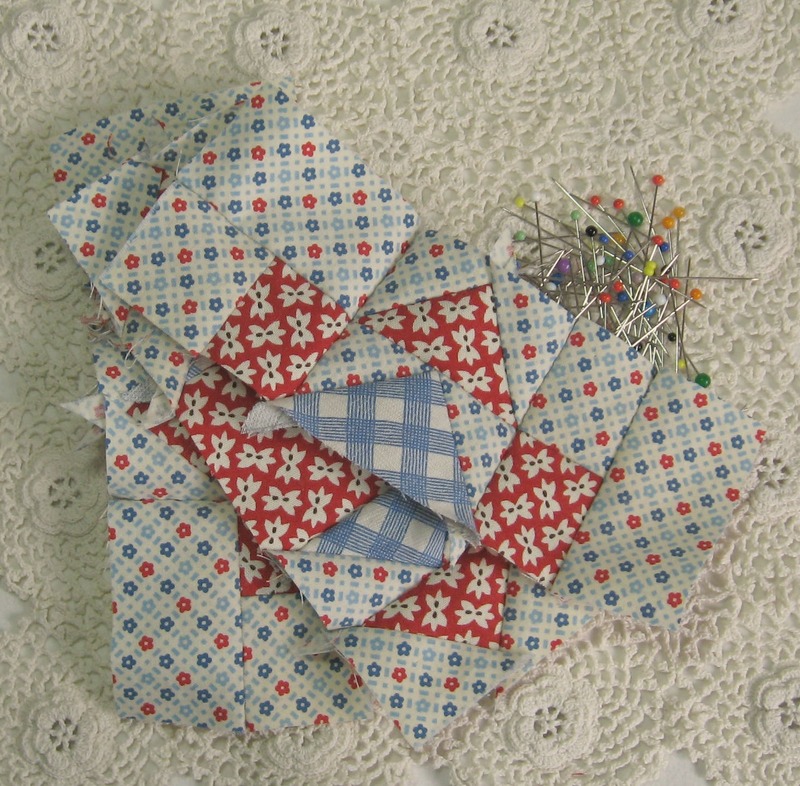 The blocks in the top picture are an evening star variation (called square and points), a nine patch block, friendship star and then cat’s cradle. 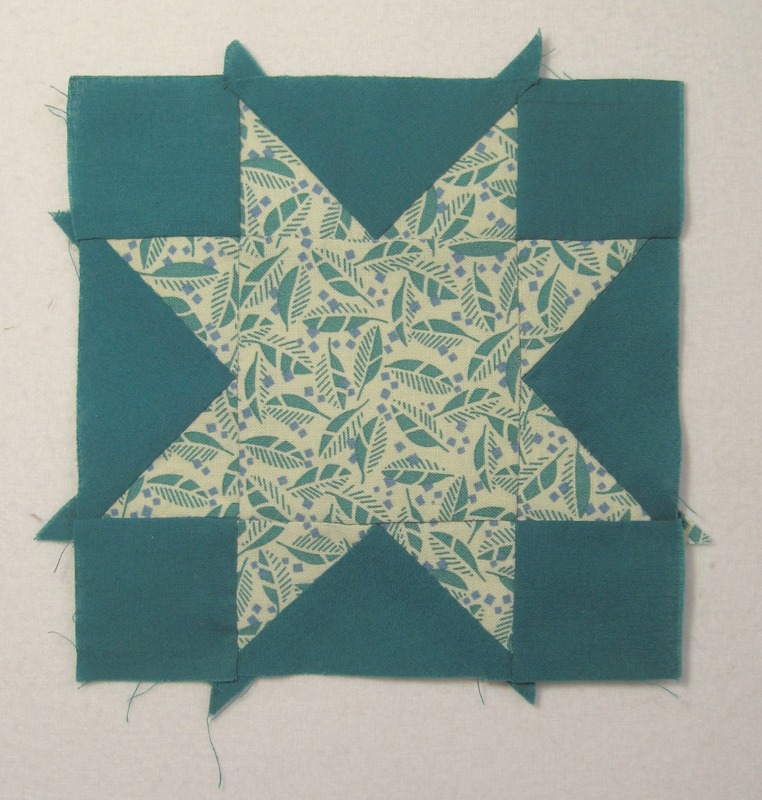 I’d already re-sewn the evening star before but as it’s such a simple but striking block I felt it wasn’t really looking quite right until now. I’ve highlighted the original blocks so you can compare the “before” and “after” of each block if you want. This “evening star” block was a particular favourite combination used in the star quilt for Pearl…I can’t decide which print I love the most. My original choice was a bit too brash and modern when placed with some of the more subtle choices. On the whole I don’t really use a lot of “dark” prints, preferring mid and light tones. I’m aware this doesn’t give my patchwork as much depth and interest as one using dark, mid and light but I like those softer colours. Some of my “lights” are very pale so depending which mid tone print I use I can create more of an offset in contrast that way. I think it’s really a case of personal choice. I’d rather a patchwork top that I love than one that is “correctly balanced” but uses fabrics I feel are too dark for me. After making these six new blocks I’m already wanting to make more so don’t think “dear ethel” will be finished this year (at the end of the day this is a quilt for me so there isn’t a time scale or rush to get her finished as quick as possible……however in my head I’m thinking it would be nice to have a vague time frame planned, if the rest of the blocks can be completed this year, maybe with sashing and then to allow next year for a flying geese border** and the quilting…..I’m thinking she may be ready for A Festival of Quilts 2017. 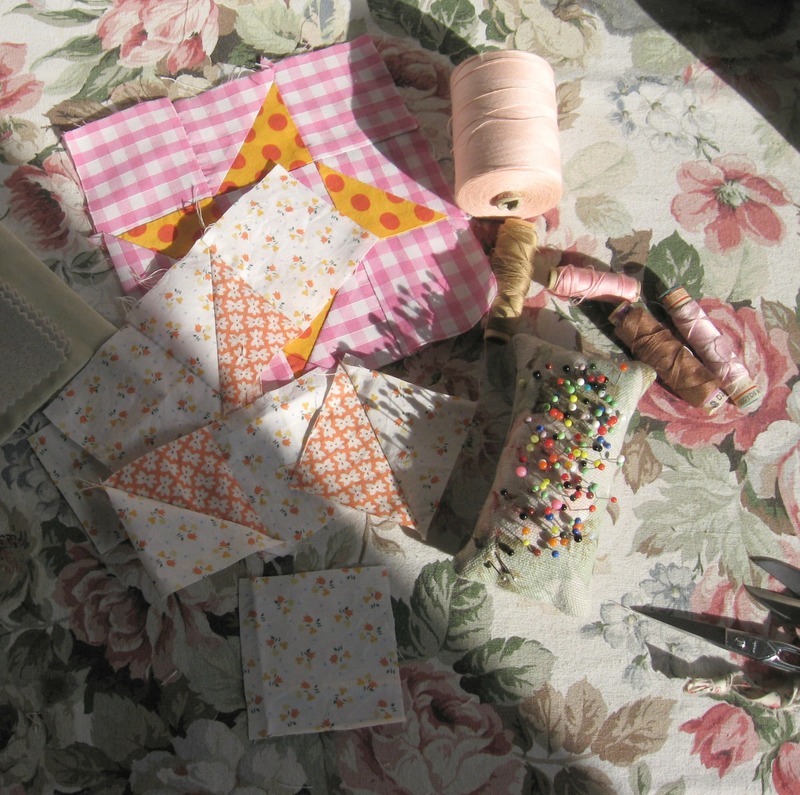 Morning shadows and patchwork piecing……………. 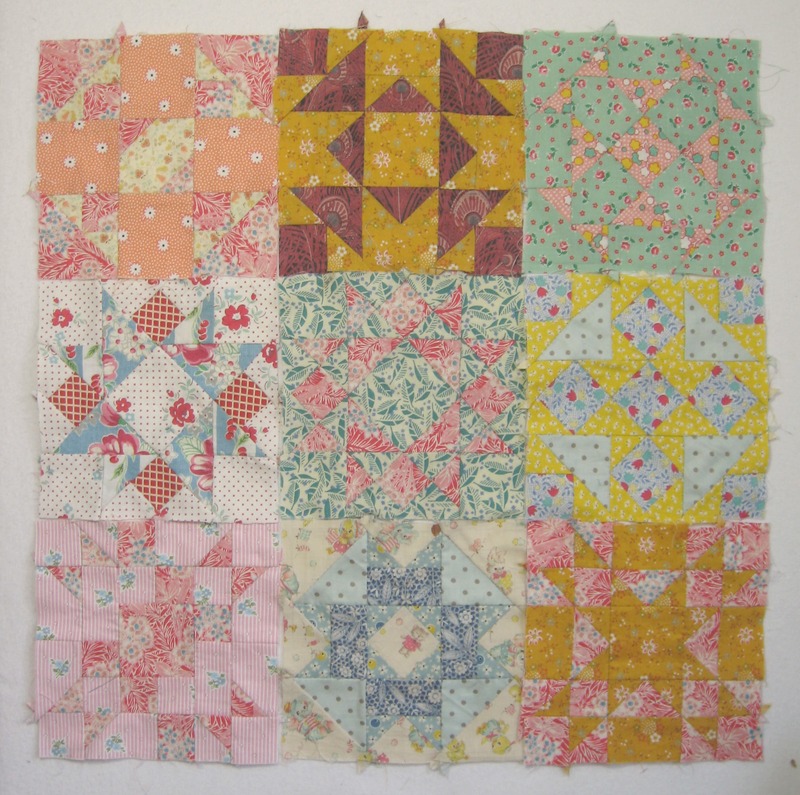 The other weekend I had a bit of a tidy up in my studio/work room and sorted through the 120 some blocks I’d sewn for my “dear ethel” quilt……as I looked through them there were a few that I felt weren’t quite right…..a couple were a bit too brash and bold, and a couple I was no longer happy with the fabric choices I’d made….I know I could have just left them be…but this quilt is intended as something special for me and I know what I’m like, I’ll be in bed and won’t see all the blocks that are perfect and beautiful and which make me happy….I’ll just see those blocks that don’t sit right…even if I try to hide them in corners or edges I’ll know they are there, so decided to put to one side the blocks I wasn’t liking (they can be made into pot holders to use near the stove) and made a list of what needed re-sewing….. 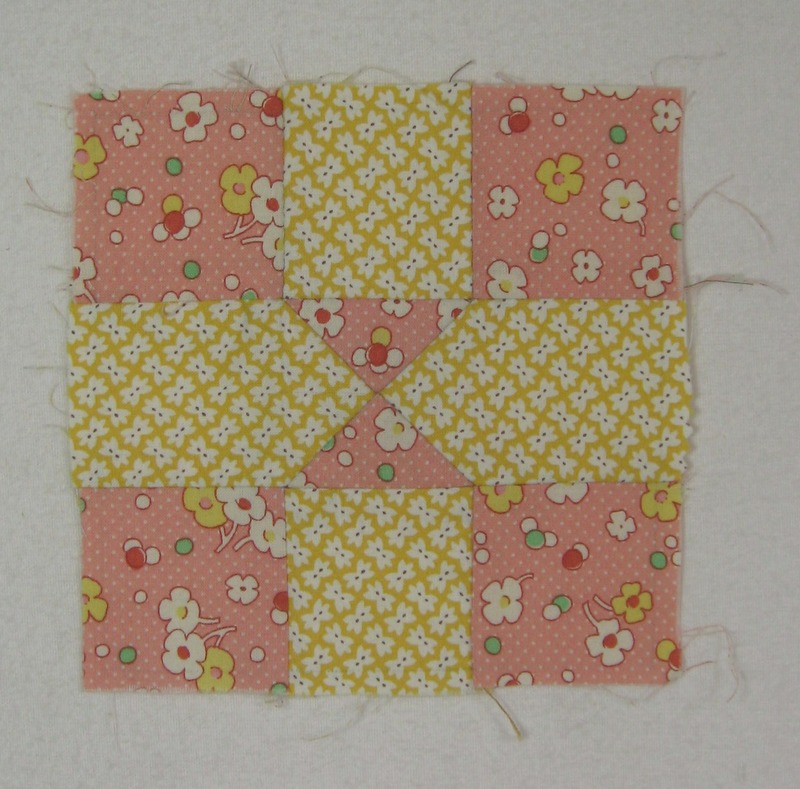 The first block I’ve sewn is this little pinwheel…I love the bright combination of orange and pink, but I wasn’t careful enough when I cut out the gingham, the pattern doesn’t lay true across the block…I’m thinking to make the quilt a bit bigger than I had first intended (so I think I need to make another 24 blocks on top of the half a dozen or so I’m re-sewing) so will use the pink/orange combination again, maybe use a different pink rather than the gingham…..
For the new block I’ve used a couple of the fabrics I bought recently for the twins quilts….the tiny tulip fabric is so delicate, and I particularly liked how it combined with the more robust orange bow-tie print. Now we have the lovely light mornings, I’ve set my alarm a little bit earlier so I can get up and enjoy the soft light that floods my work room this time of year…..early mornings are my favourite time, the house is quiet and not yet woken, if Bernard is on the table there is the gentle sighing and soft snore of him sleeping…shadows cover my table and as the sun comes up they move across my work…..
Later on I’ll put on some music, or listen to the wireless but before anyone else stirs and gets out of bed I prefer the quiet….I open a window and my room is filled with the early morning call and sing song of the birds in the garden…..in the distance there is the low rumble of a train……the gentle sighing as the day itself seems to wake up and stretch into being……. This is the time I try to use for sewing for myself, no commissions, no sewing for shops or craft fairs, but simply sewing for myself whether it’s patchwork blocks for “dear ethel” or darning socks…..a cup of tea near my elbow and I’m eased into the day. The new block is much softer in colour than the one it’s replacing but it doesn’t jar and it sits in well with the other blocks sewn…..a couple of the blocks I’m re-sewing I’ve un-picked because I liked one of the fabrics used in the block and didn’t have enough left to re-make again….maybe I’m being a bit precious but I want this quilt to be just right so am happy to spend the time it needs, unpicking, re-cutting, hand sewing……. slow stitching indeed. 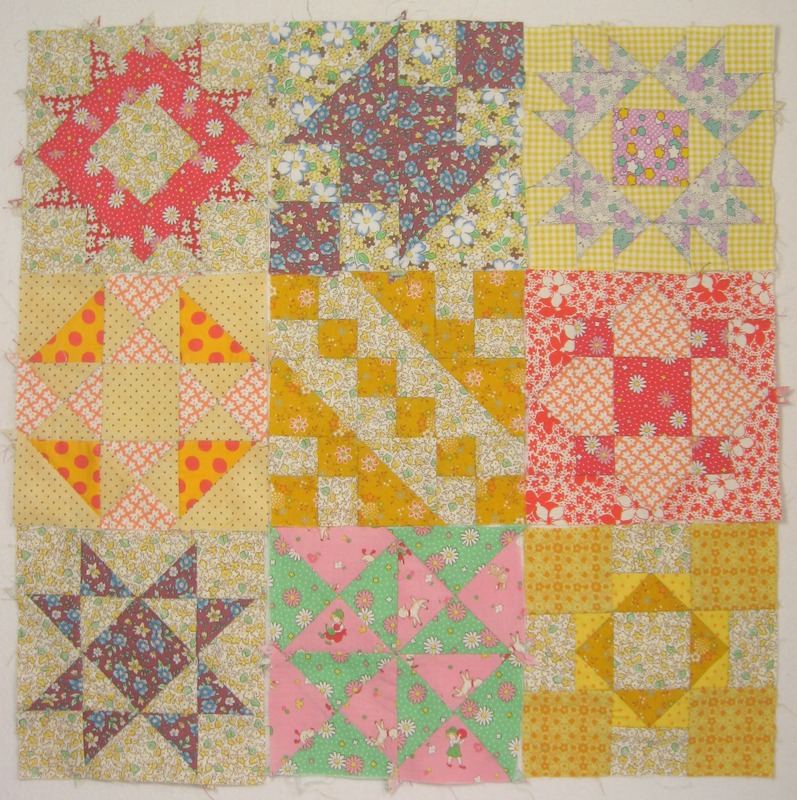 Last Summer when I was going a little patchwork crazy hand piecing six inch blocks for “dear ethel”, I found myself repeating a couple of the blocks that I had previously sewn. I’d planned (planned makes it sound like there was a method to the madness….there wasn’t. 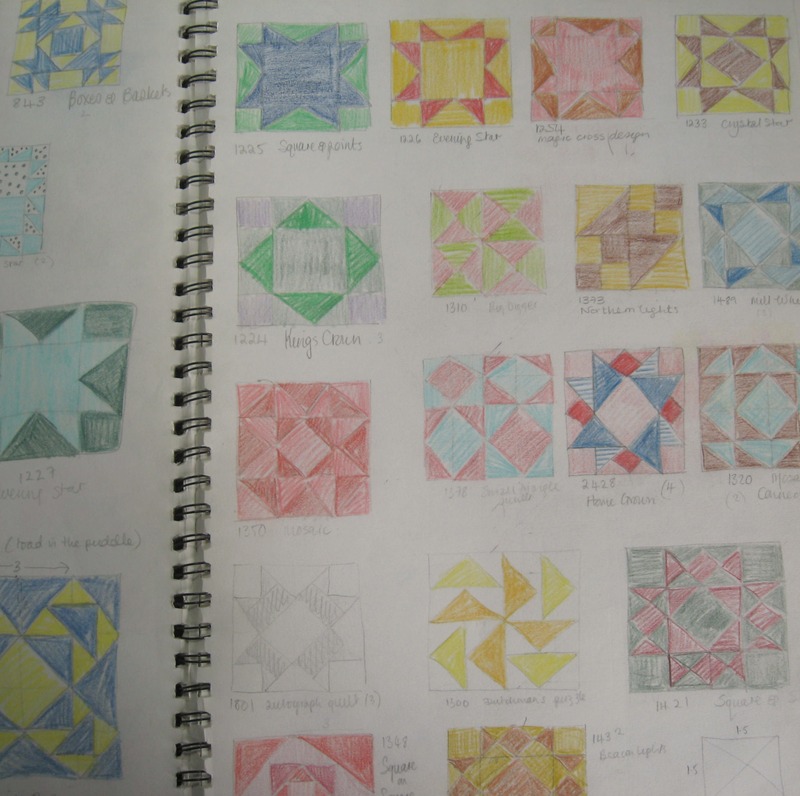 I just picked blocks that I like in somewhat of a willy nilly fashion) for all the blocks to be different so rather than keep unpicking doubles I began to draw out and colour in blocks I’d made so I had a record of what I’d pieced so far….. So I knew what I was doing and didn’t get confused by what is a very simple system, after making around some 40 or so blocks, I worked through the above mentioned tome and drew out any blocks that I thought might work well, writing down the number of the block underneath the block. I’d noted down which blocks I had already made and drew them in numerical order so I could keep track of what I’d sewn so far. 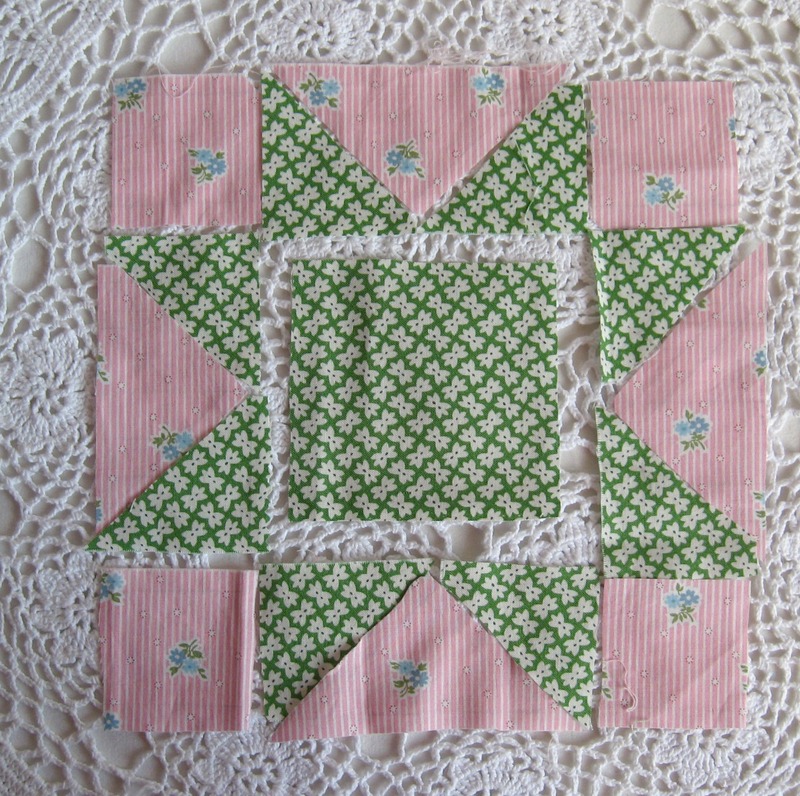 Most of the blocks I used are based on 9 square grid (3 x 3)….a few are 16 patches (4 x 4) but as the blocks are quite small being 6 inches square I thought that the 9 patch size would be the easiest for dividing and hand piecing. 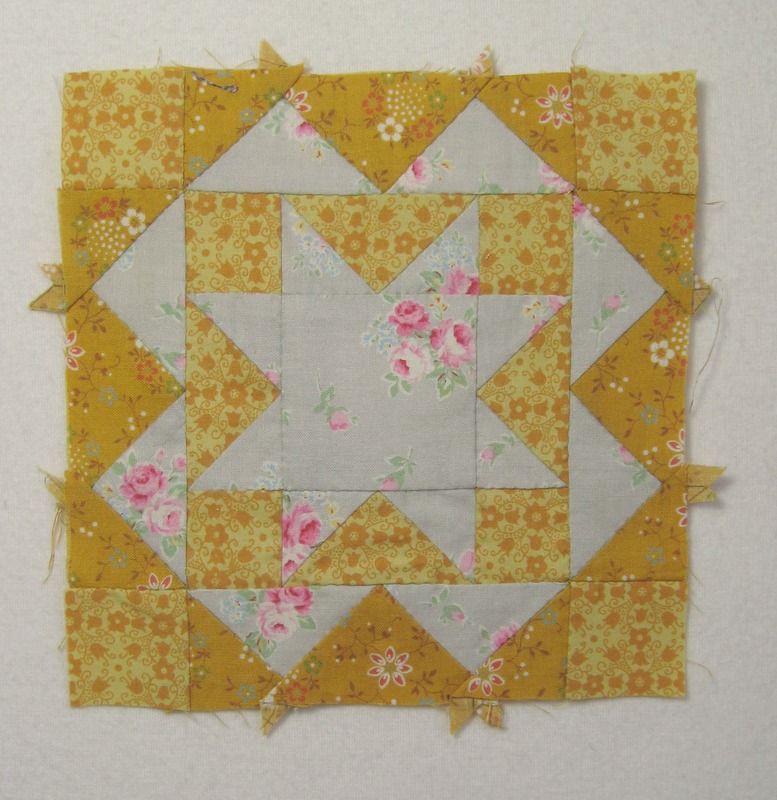 I think the smallest square or half triangle is like 1 inch, which I felt was small enough for my patchwork (and my eyes). 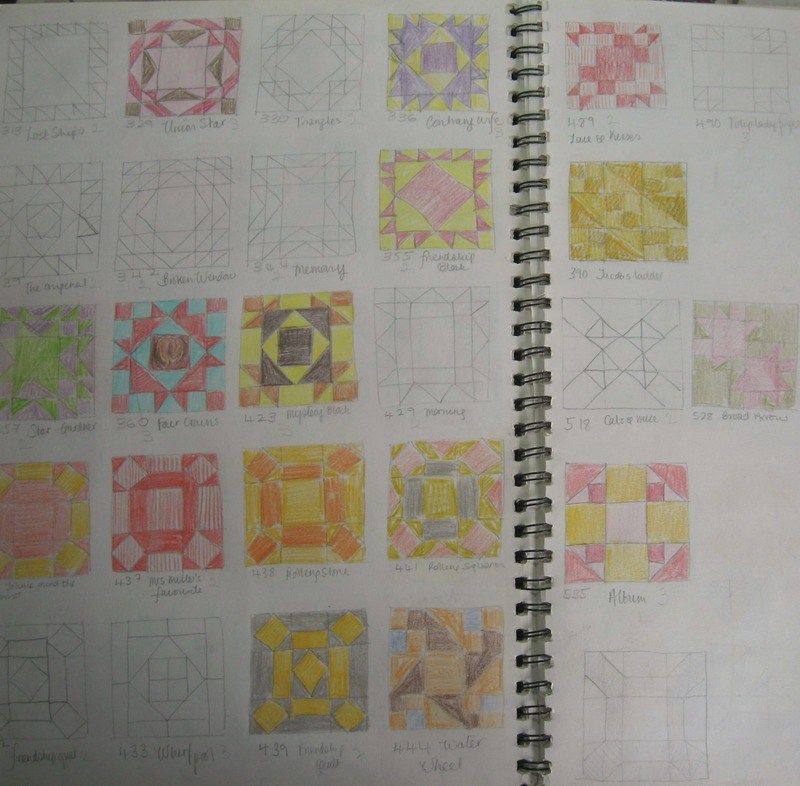 Something I did find by working in a book was how I was able to keep track of colours used….when the sewn blocks are laid out I am aware of some repeats of colour combination (pink and yellow just kept being made together again and again) but it’s more subtle as the shades change, the fabric patterns are different….when I was looking at the coloured blocks it was more noticeable and it made me start thinking about moving away from old favourites and to try out new palettes and blends. While “dear ethel” is about using my favourite fabrics and making a quilt for me (it’s not for a quilt show or competition, it’s for me…there’s no deadline and if it takes how ever many years to make then that is fine….slow sewing indeed) I didn’t want it to be just a yellow and pink quilt or a orange and grey one….so some combinations of colours aren’t ones that I normally use…and I think it’s looking all the better for it. 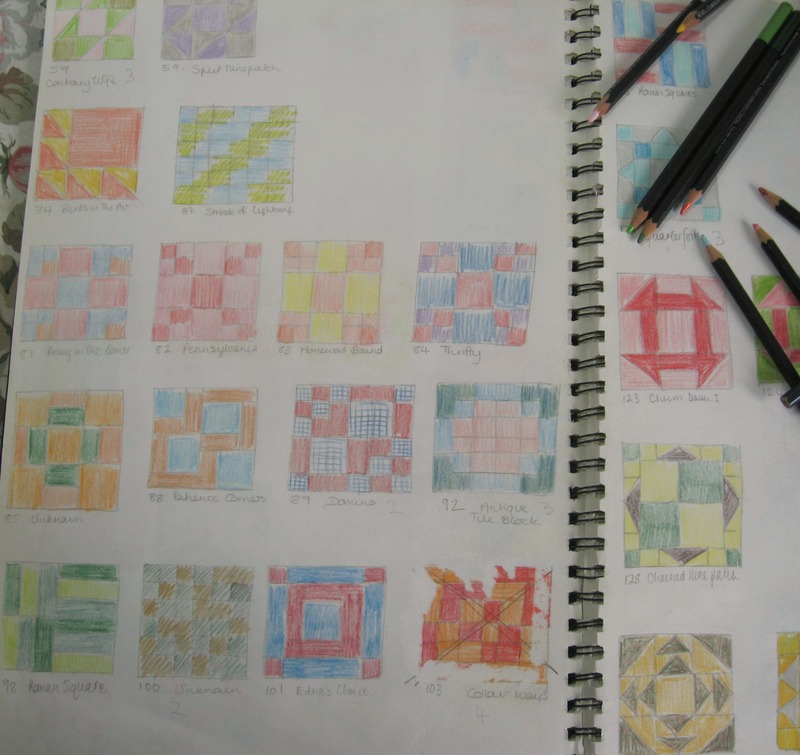 Once I’d drawn out around 175 blocks that I felt happy with, I coloured in the blocks that I’d already made then began working through and sewing up the other blocks. I made a note of how many colours each block had, and what they were called which sometimes made a colour choice very apt. Mostly I just played around with a few fabrics before deciding on particular choices, fabrics that were appearing time and time again were kept to one side, it’s always hard with favourite fabrics to keep using them but I’ve got a lot of favourites and wanted them all to have their chance to shine…. 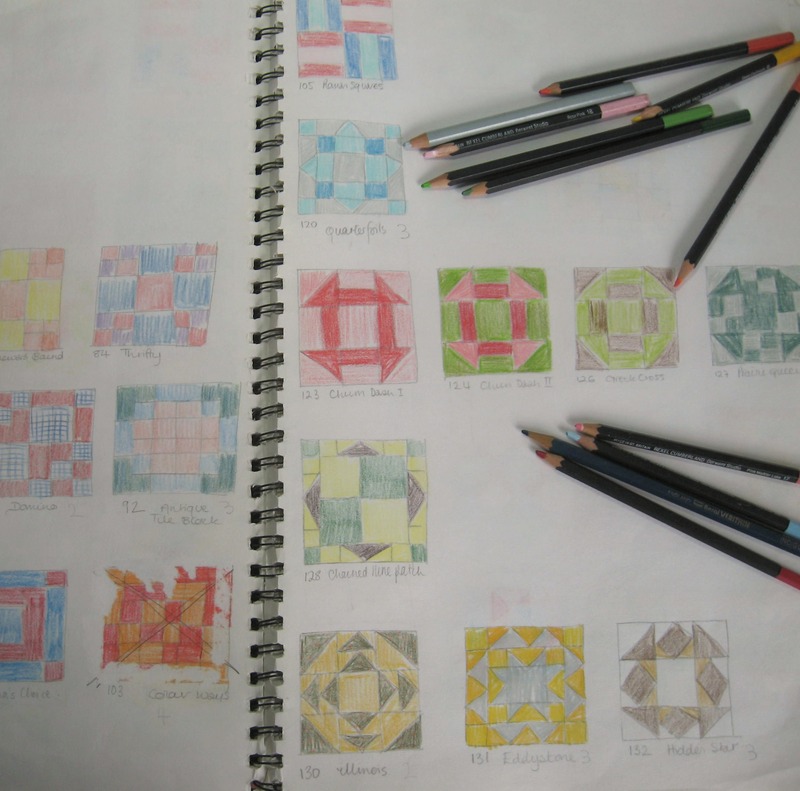 Some blocks once drawn were made and then coloured in but on reflection weren’t used, they get unpicked and are used in other blocks. I noted which these were as a reminder for another time…..(you’ll see a couple of these if you click twice on the above picture…they just looked odd and jarring compared to the other blocks……even though I made other blocks all of one colour, these particular ones really weren’t doing it for me.) But a couple of minutes unpicking, a press with an iron and the fabric is fine and dandy, all ready to try again in another block. Flicking through this has been really helpful while I’ve been planning the quilt’s for Olive’s sisters…it’s reminded me of blocks I particularly liked, and of blocks that I liked but for various reasons didn’t get chosen for “dear ethel”…I think (and I really do need to re-count them) that I still need one more block. I wasn’t fussed about trying to reproduce the fabrics I’d used, just noting the colour was more important…when required I show stripes or spots but that is as fancy as it gets….it’s really a resource for me to keep track of what I’ve made and which blocks I liked. I find working in a sketchbook really does make a difference to how I come to an idea (it generally involves a lot less un-picking)…not everything is planned out first (and I’ve had more than my fair share of successes by just going with what feels right) but when I take the time to have a play around with some colouring pencils then I inevitably come up with something that I wasn’t able to see in my head….and often what looks shimmery almost dancing at the edge of my vision, but the best quilt in the world, looks completely pants once I start drawing it out and trying to understand how the pieces fit. *being super cheeky, if you have any of this or know where I can get it then please please do let me know….I think I bought it about 10 years ago and it’s possibly a Lecien print but really I’m just guessing. 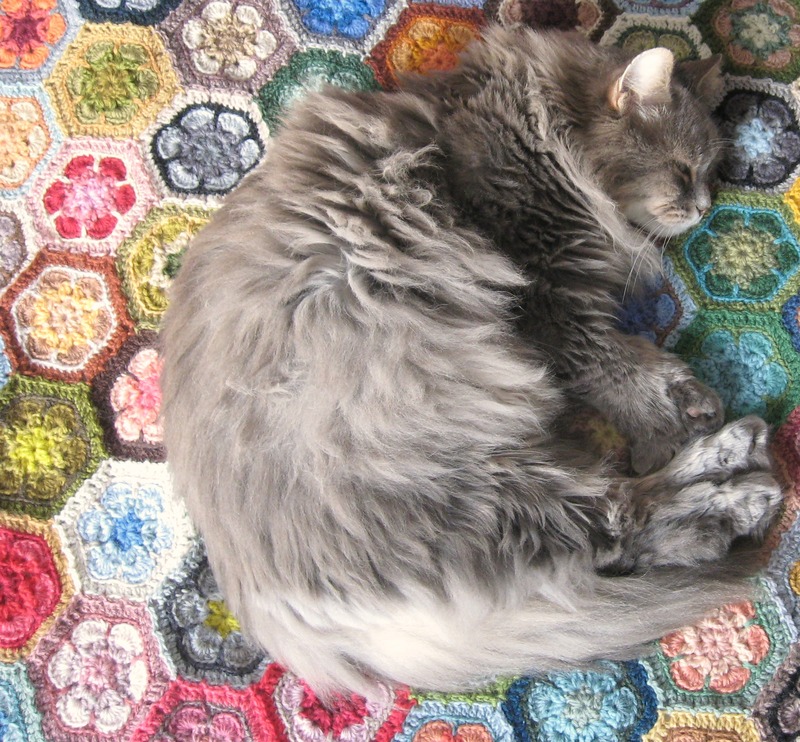 Shetland knitters, embroidery stitches and a slow and sleepy Sunday……..
Sunday is nearly over and I’m not sure where the weekend has gone…..though one of us has spent the time sleeping and recovering from a trip at the start of the week to the cat dentist! (4 teeth removed and a de-scale and polish….sadly no “look at my smile” sticker on the side of his basket when I went to collect him)….he’s still somewhat drowsy and a bit slow moving, but his appetite is back and he’s making fast work of emptying his food bowl. I seem to have spent a lot of the weekend un-picking embroidery that wasn’t really working out as well as it looked in my head…sadly the reality didn’t match up to my glorious imaginings …to begin with I tried to be all frugal and un-pick what I’d sewn but then I just got all fed up, so out came the embroidery scissors and snipped out the stitches…..I’m embroidering a cafetiere cover for a commission and the design has been left up to me which you’d think would make it easier but not so. A lot of tea has been drunk in trying to get the design to work, so far to no avail. While I’ve been sewing and un-picking, I’ve had the chance to listen to a lovely series that was on Radio Scotland, it’s called Our Story, part six is all about Shetland knitting. 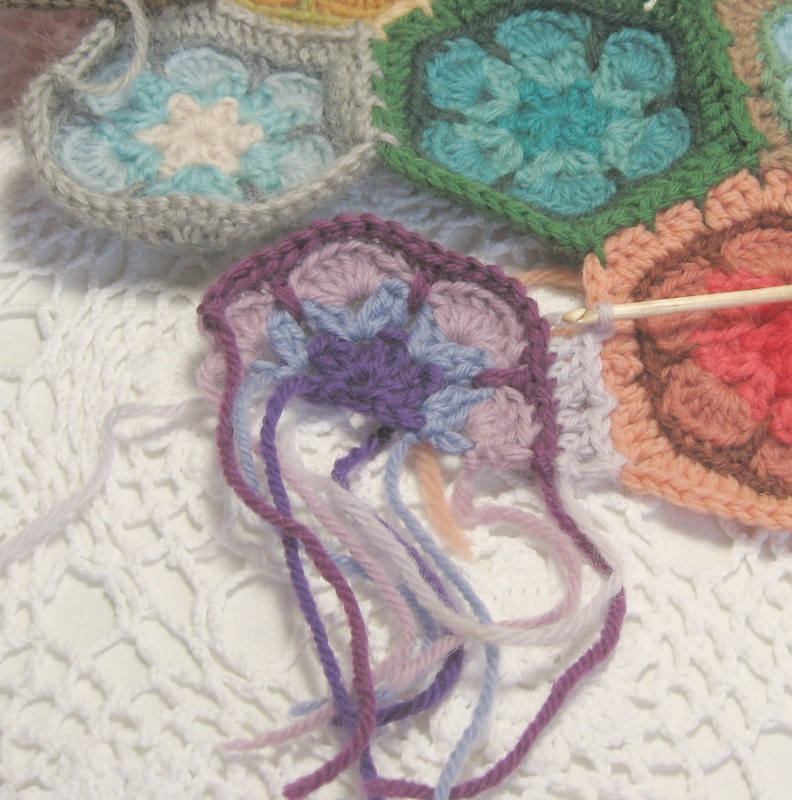 I read about it on Ella Gordon’s blog (she’s one of the knitters interviewed for the program). It was great to listen to, learning a little about the history of knitting in that region and the importance it had for people’s livelihoods….but also how important it still is today…one of the nicest parts for me was to just listen to the actual voices….the love and joy of knitting and wool came through so much on the the program. Everyone was so enthusiastic, I couldn’t help smiling listening to it. One of the ladies on the program was knitting using a leather knitting belt, and it made me think back to the start of last year when me and a friend went to The Time and Tide Museum in Gt Yarmouth…..it’s a local museum which really centres on the fishing community of Gt Yarmouth. One of the exhibitions had a case in it with items relating to whale fishing and near to that there was a small piece about the women and girls who used to gut and sort the herrings. In their case was a selection of old knitting needles and some of these knitting belts, it may be my memory playing tricks on me but I’m pretty sure it said that many of the women used to travel down from Scotland to do the herrings. Anyway, the radio program is available to listen to for another 29 days and it really is well worth it, even if you aren’t a knitter it’s still very interesting…..I ended up listening to a couple of other episodes and the one about the draper’s van was so heartfelt and sad, it reminded me so much of growing up in my village, when we had a bread van and the fish man, the coal man and the Corona man…. 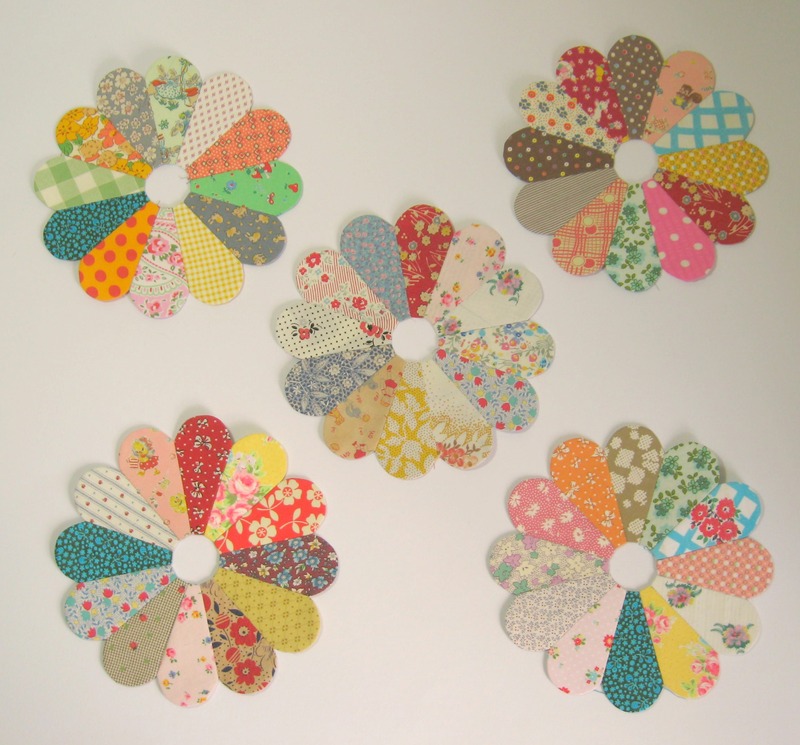 I’ve also been trying out new combinations for “dear ethel”……. one of my friends came round for a catch up on Friday and she hadn’t seen the patchwork blocks, so out they all came and they were then spread out over the carpet as well as they could be (they kind of take up a lot of space when they are all laid out)….I was explaining that I didn’t really know what to do with regards to sashing or not, I sort of want to sew the blocks all together but at the same time I think that might not work so well, not because the colour combinations might be too much (hmmm it would look rather colourful and then some besides) but more because the blocks themselves might not look so defined…..
One of my initial ideas for sashing was to sew 1/2 an inch of different coloured fabric round each block but I now think that might be too messy and that perhaps sashing of one colour would be best (with tiny inch squares using the different fabrics in the patchwork where the sashing meets at the corners)…but then which colour to use…. 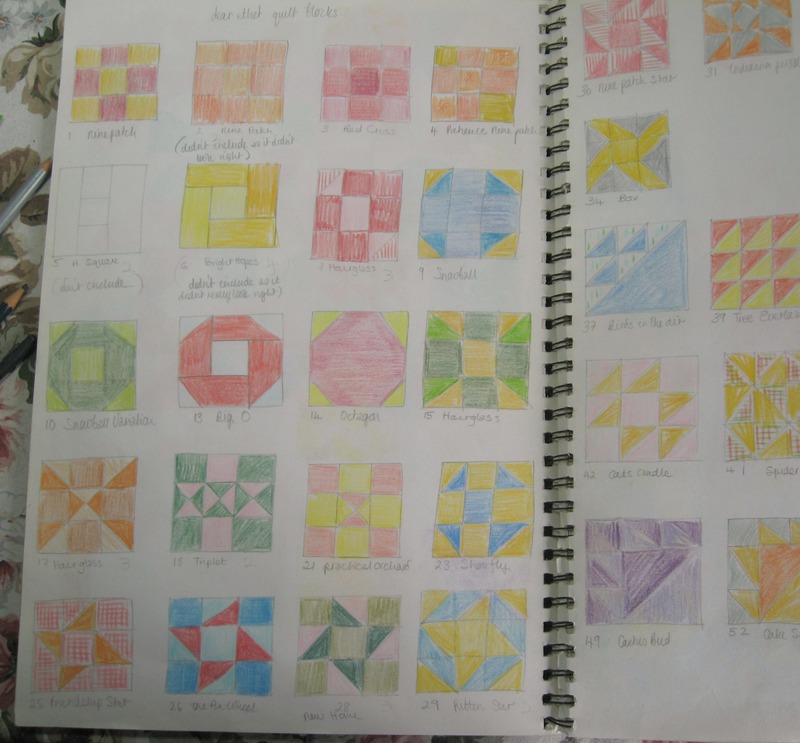 I don’t really care for anything like white or cream (knowing Bernard he’d soon make it all puggy and mucky) and am thinking about a pale grey….hmmmmm I know I’ll just have to bundle up the blocks and take them with me to my local quilt shop next time I go to Bungay and test them out. 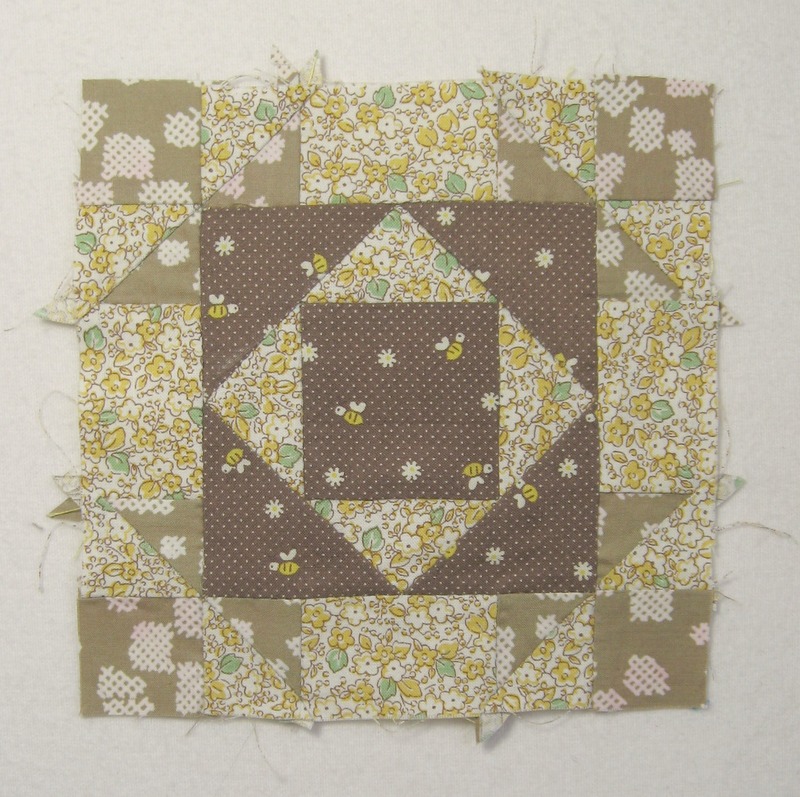 I still want to make a border of flying geese to edge the patchwork with. I can’t believe I actually thought I was a good halfway through the quilt, but with sashing to sew and a border to make, and then the quilting, I can see it will still be a good while before this goes on our bed. 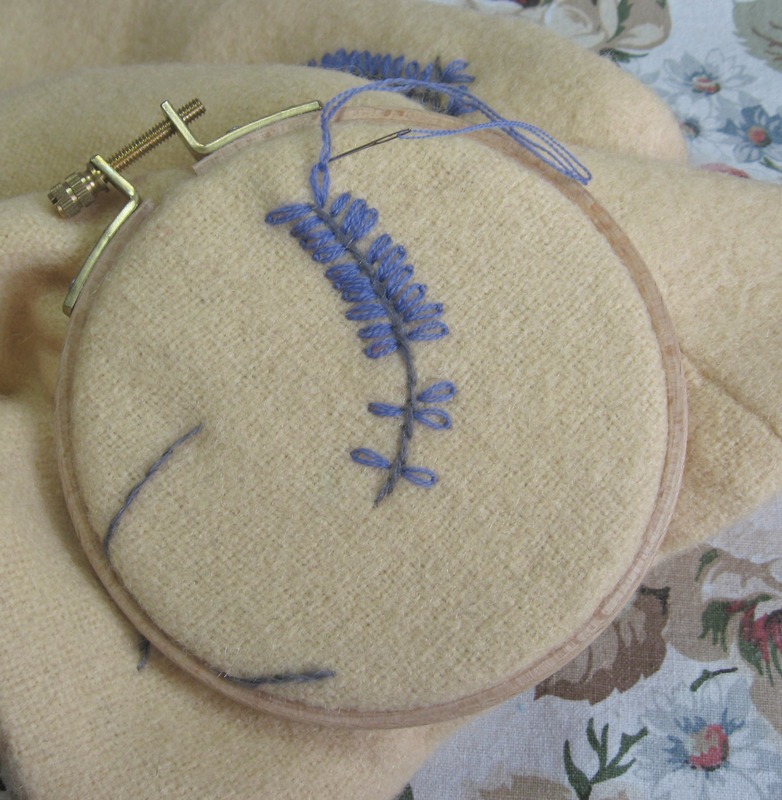 I don’t ever begrudge the time spent sewing patchwork though, I’m all for slow sewing…..whether it’s the constant repetition of small stitches in quilting, or the movements in wrapping the thread round the needle for fancy embroidery stitches, there is something so relaxing and satisfying in these small details that form most of my work. I don’t mind if something takes a while to make, though obviously if it’s being made to sell it’s difficult to cost accordingly…… but inevitable the way I prefer or which I find gives the nicest result is the way that takes up a lot of time….slow is the way I tend to do most things, even the way I make bread now takes the best part of the day (though I can use the proving and rising time to do other things). This isn’t a blanket that you make in a weekend and whenever I’ve read about anyone else making one they also mention the time factor with this pattern…but rather than seeing the time involved as a bad thing, as a negative, maybe it should be celebrated……..”slow crochet” could become it’s own movement like “slow sewing”. Making this slowly I’ve been able to buy and add wool as and when I was able to afford it (using tapestry wool bought from jumble sales, charity shops, car boots etc made this much more affordable….the wool for the blanket top is well under £100, and yes that is more than if I had used acrylic but I really don’t like using that, and I like the softer feel of wool). 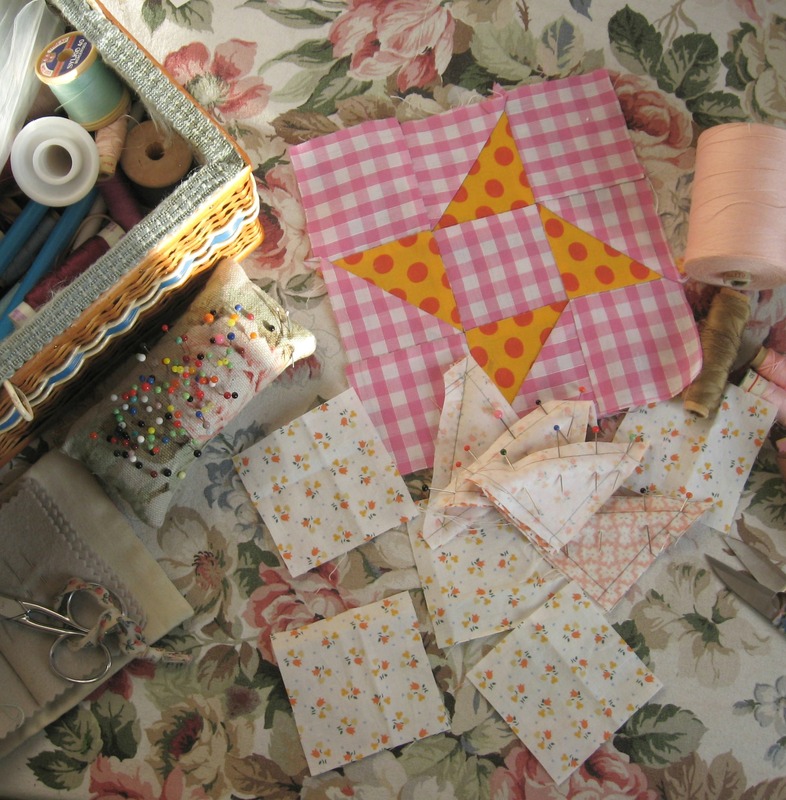 But I’m also happy to put it away when it’s too warm to work on and pick up patchwork for “dear ethel” instead……. It used to be, when trying to finish something, all the reasons of why I was making it seemed to go out the window, all in the idea of getting it made as quickly as possible, and then on to the next thing…….and before I knew it I had a pile of half finished things that I really didn’t have a lot of enthusiasm to ever finish. Over the past few years I’ve tried harder to not start new things just to do new things, to appreciate more the making and why I’m making rather than buying…..half finished things that were just making me feel miserable that the enthusiasm for had died (and which I knew I’d never get round to completing) have gone to the charity shop and I’ve left myself maybe half a dozen smaller projects along with the blanket and some patchwork pieces that I really love and know will see the light of day. To finish our slow Sunday, we’ve got a butter bean and squash casserole for supper, the squash was slowly roasted in the oven yesterday and the rest of the casserole has slowly been cooking this afternoon o the top of the stove…the kitchen smells lovely, warm and comforting, bread is baking in the oven. So even though I’ve not ticked off half the chores and want to do’s on my list I feel quite content. 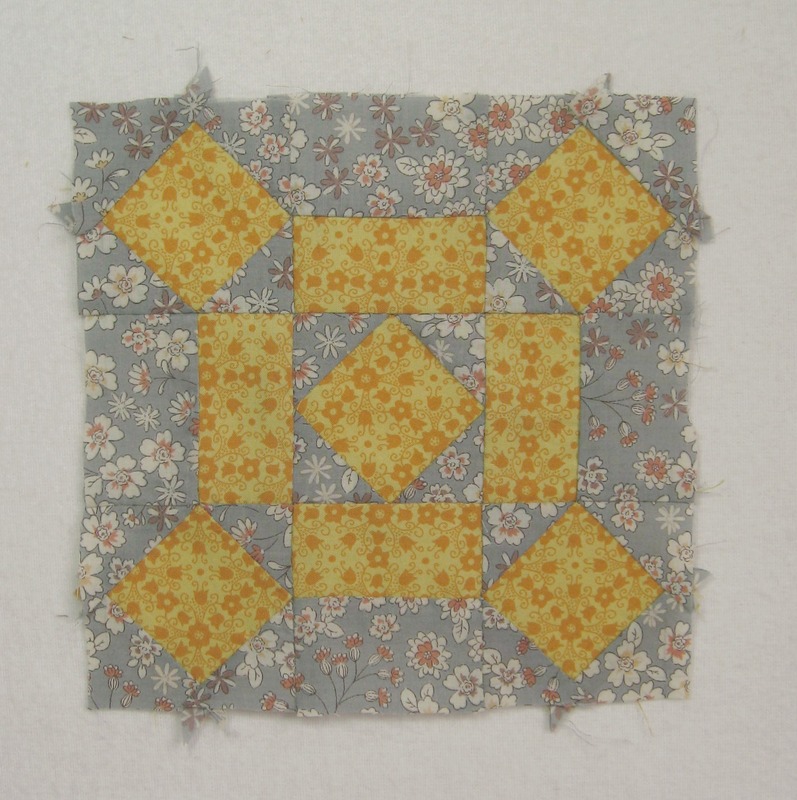 I’ve just finished sewing two more hand pieced mini blocks for “dear ethel“, this one is a favourite colour combination of golden yellow and grey. It’s called Friendship Block. It’s very apt for today’s weather, bouts of glorious sunshine then grey and cloudy skies making everything dark and gloomy…..this morning started off really lovely and sunny, but now it’s really Autumny skied outside, I’ve put all the lights on in my work room as it’s so grey and gloomy. This was block number 120 so only one more to make now…….I feel a bit sad that I’ve almost finished sewing them, however it’ll be nice to begin sewing round sashing fabric and then piecing them all together, but I probably won’t start that until after I’ve finished things for Christmas Fairs and the like. 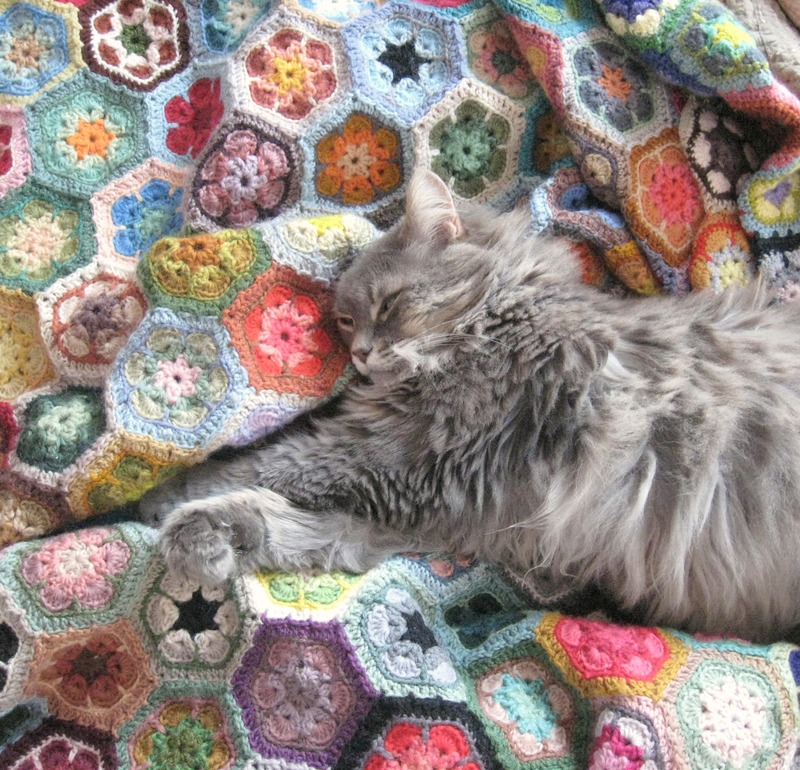 I’m currently trying to get to grips with finishing the Granny’s Paperweight blanket, evenings when the light isn’t good enough for fine sewing or matching threads is spent sewing in tails and tackling those half hexagons and zigzagged edges, it feels like I’ve had my eureka moment and the blanket is finally coming together a bit better. In the meantime I’ve also been working on a couple of other crocheted items which I hope to share very soon, but an eye infection and a crooky neck (I seem to have sat in a draught in my work room when the window was open) meant the weekend sewing and crocheting was quite literally, painfully slow. Knowing I looked like Quasimodo with a semi closed eye and hunched up shoulder was a good excuse to stay inside and rest up on the sofa with a pot of tea. 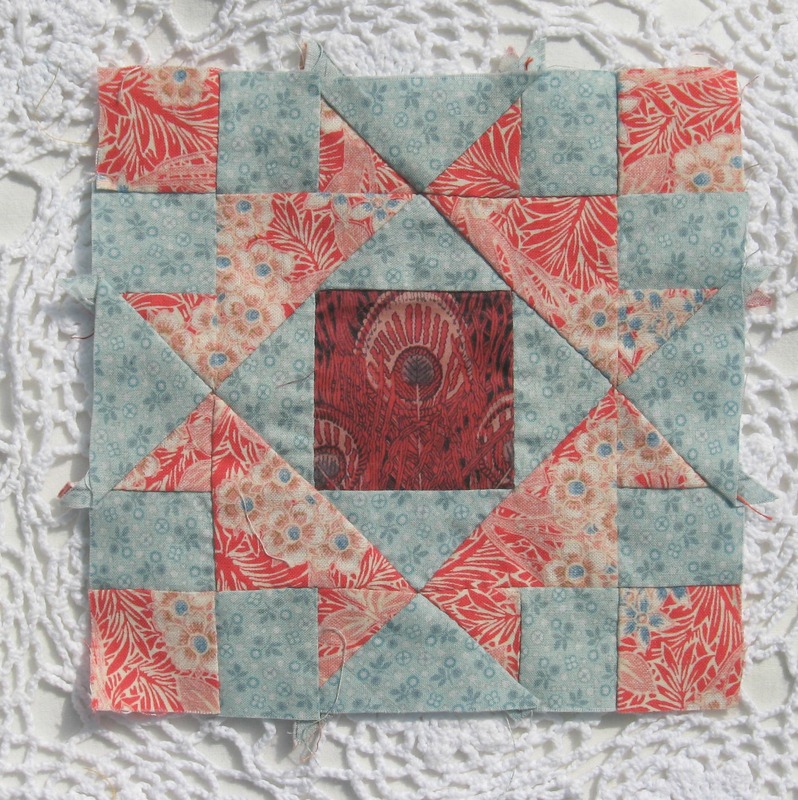 I like all the reds together, and especially that red V and A fabric in the centre…..maybe it’s the scattering of blue flowers in the centre…..it’s such a beautiful print. And finally this grey and yellow block is called Eddystone….I like the mix of mustardy golds together with the grey, it’s a favourite combination that I just don’t tire of. The book I’m using for my block references is 5,500 Quilt Block Designs by Maggie Malone, it’s a huge tomb and weighs an absolute ton…..the block designs are split down into how the block can be divided which helps a lot when drafting them and deciding which works best in the size you are planning (“dear ethel” is being made up of 6 inch blocks, so I’ve been able to use blocks from the nine patch …3 x 3…..and the four patch ….2 x 2……both of those divide nicely into 6……..however some of the other blocks don’t divide as well when you are working small and it’s best to save those for larger planned pieces) It also gives a list of the various names the blocks are known under, some blocks only seem to have one name, others are known under many various guises, and sometimes the same name is given to a variety of different blocks. If I’ve called a block a different name to what you know it as, then please do let me know, it’s interesting to learn how names change from region to region. 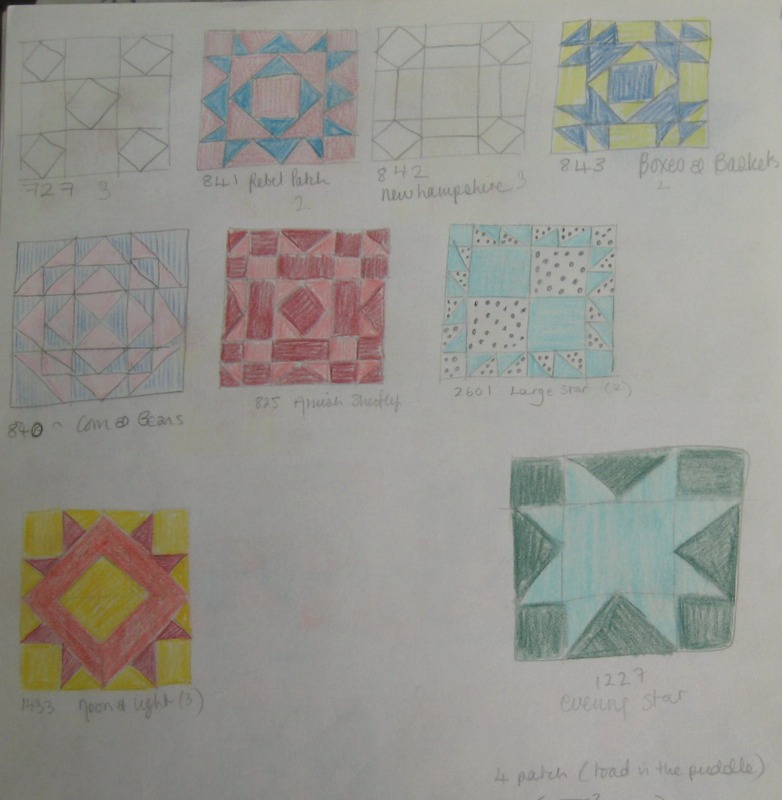 Melanie from Catbird Quilt Studio said she knows the two previous blocks I’d made as Variable Star and Sawtooth Star. Do you know them by any other names? The other week I wrote how just changing the placement of tone in a block can change it’s name. The example I used was this patchwork block…however on reflection I felt there wasn’t really enough variation in the tone of the fabric I used so I unpicked it (not the first block I’ve unpicked for this quilt, but fingers crossed it’s the last one) and used the fabric to create two new blocks with greater contrast. 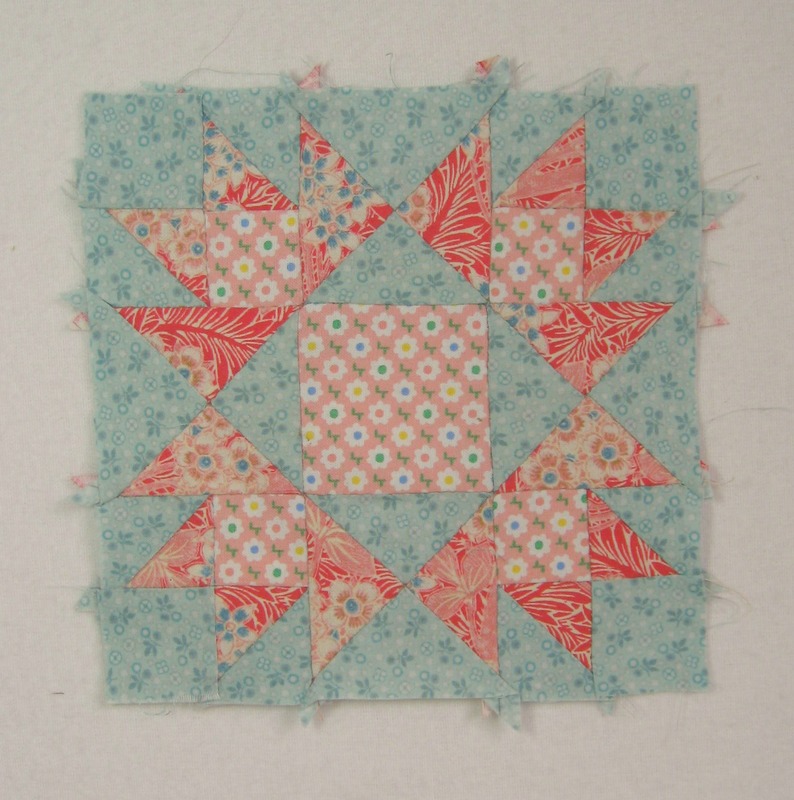 So this above block is the all new razzle dazzle version of Eight Point Star, it’s also known as Square and Points. Basically it is a darker toned star on a lighter toned background. Both fabrics are in my top ten of favourites, I’ve actually bought enough of the green floral fabric to make a frock, sadly the turquoise fabric is quite old (it’s from Sylvia’s stash) so what there is is what there is…..I think they look pretty fine together. 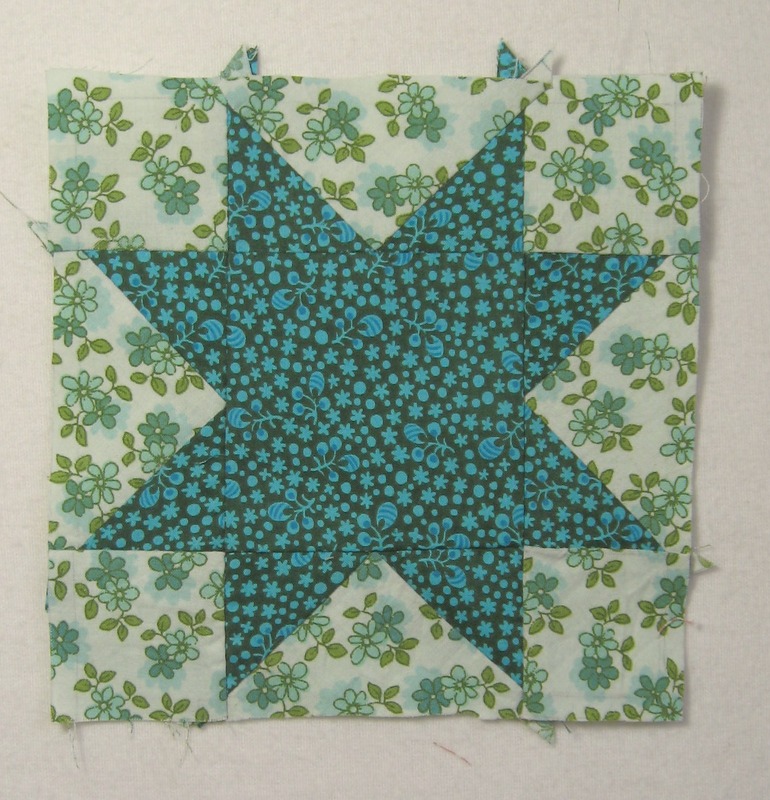 And when you reverse the tone (so a lighter star on a darker toned fabric) you have the block named Evening Star, which is also called Cluster of Stars….I love that name…….it’s the perfect name for a star patchwork. 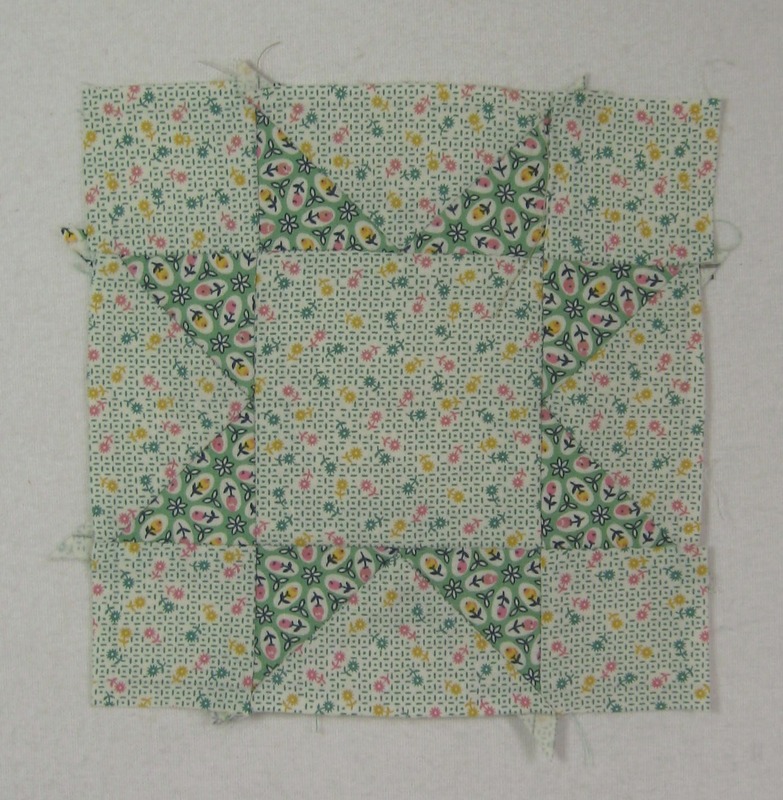 It’s a beautifully simple block, and whether you chose this or the Eight Point Star variation, it always makes for a beautiful patchwork top. It’s quite a traditional pattern but looks so fresh. 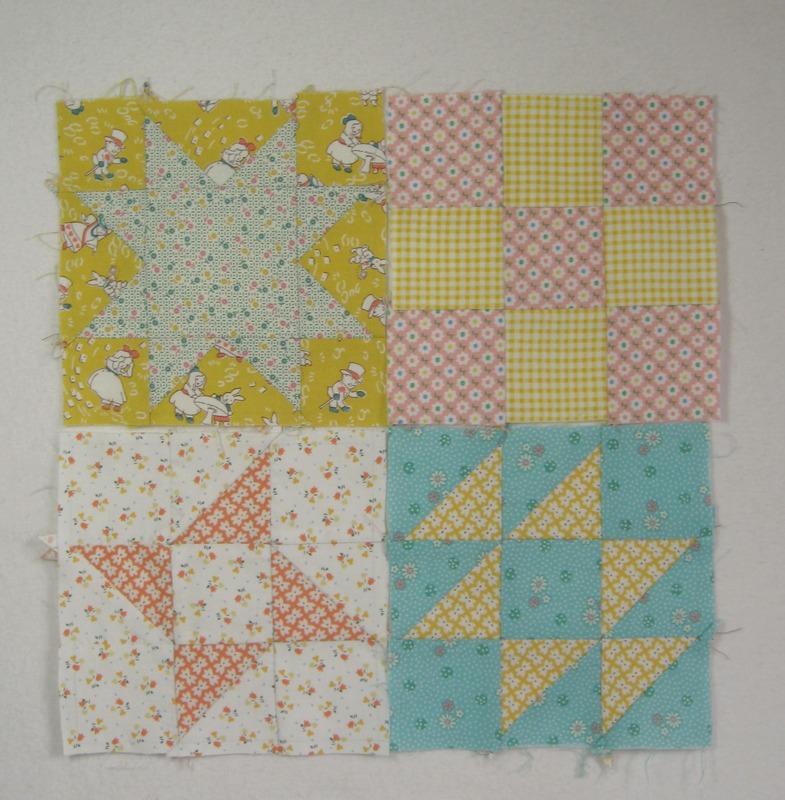 And this is a round up of some of the last few finished blocks that have been pieced for “dear ethel”. 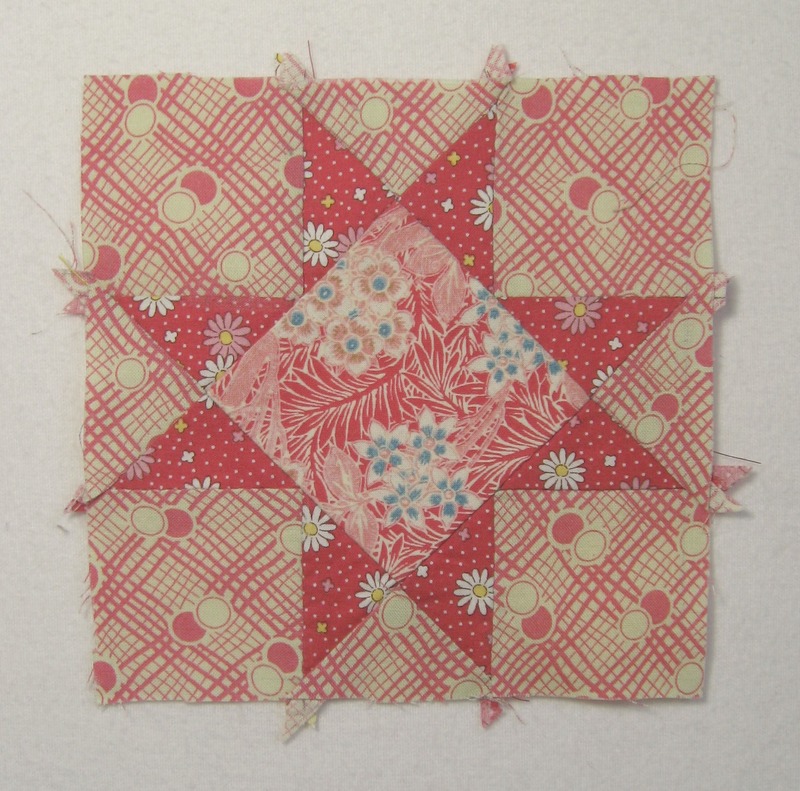 I particularly like the bottom block using the daintily striped pink fabric, and also the central block. 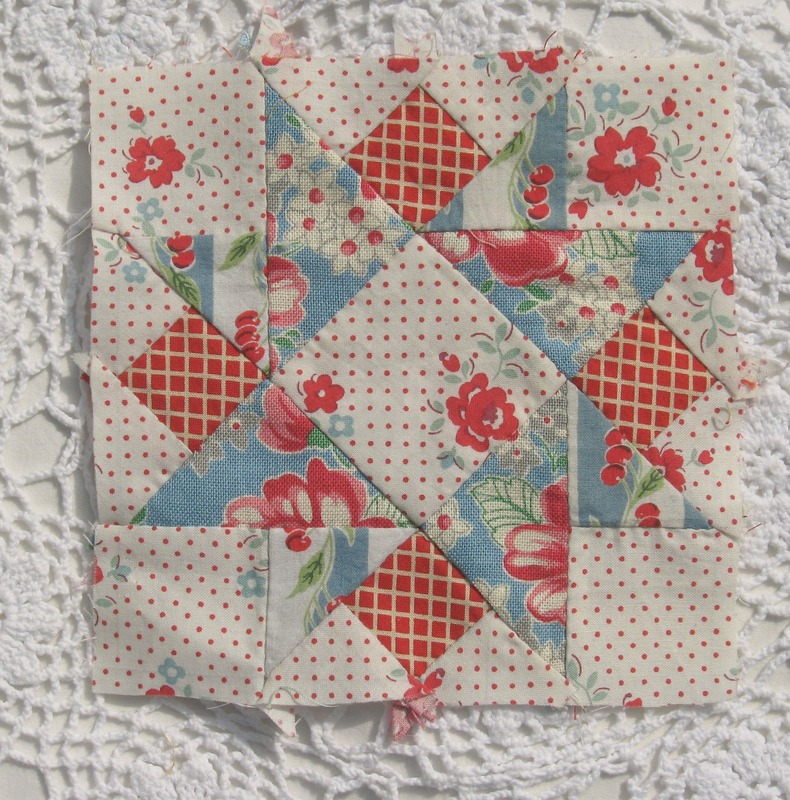 Both use the gorgeous V an A fabric by Rowan…….quite simply I’ve lost my heart to it. Another two little hand pieced blocks for dear ethel, not many to go now….this block is called Four Crowns, I just can’t get enough of that red floral V and A fabric, I just love it…..
Perhaps The House of Elliot was a subliminal inspiration….the peacock feather fabric is very 1920s looking. 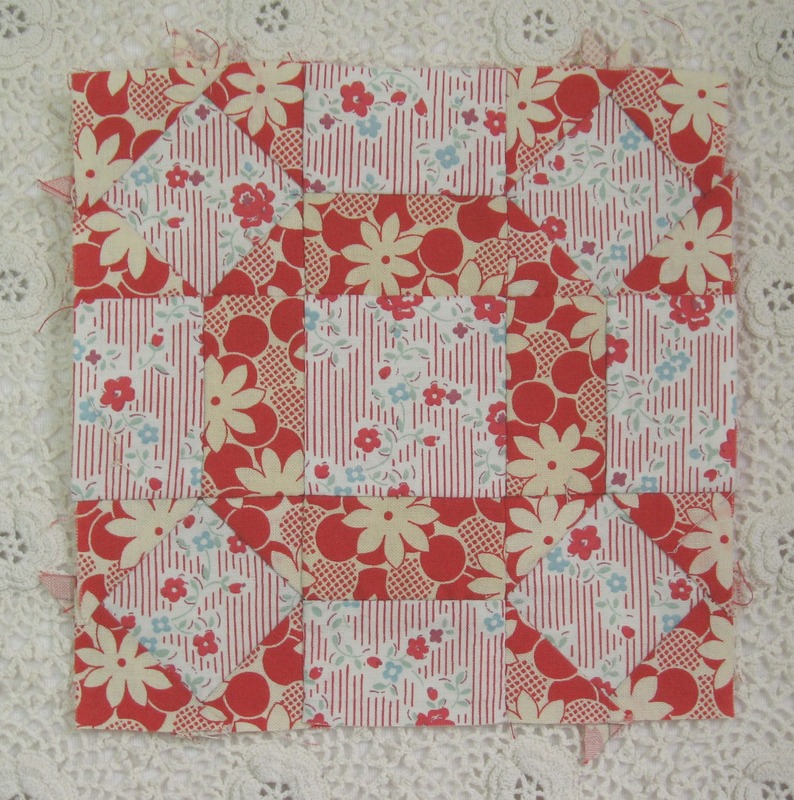 And this rather patriotic coloured block is called Homegrown…. it makes me think of 1940’s forties home front pamphlets, keep the home fires burning and general patriotic rousing….. the blue floral print is a Lecien fabric, it’s a rather heavy woven cotton which frays like the devil, however it’s so soft, and is lovely to sew. I think there are a few red,white and blue coloured blocks set aside for dear ethel, not that I’m particularly patriotic, it’s just a colour combination that seems to crop up by itself.